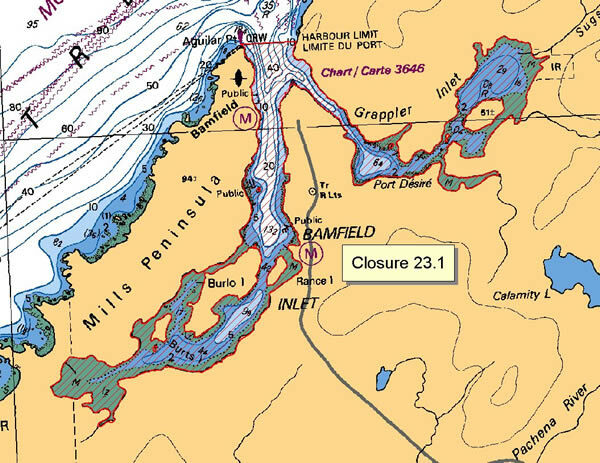 23.1 Bamfield Inlet and Grappler Inlet 23.1.jpeg The waters and intertidal foreshore of Bamfield Inlet and Grappler Inlet lying inside a line drawn from Aguilar Point light to the harbour limit on the opposite shore. 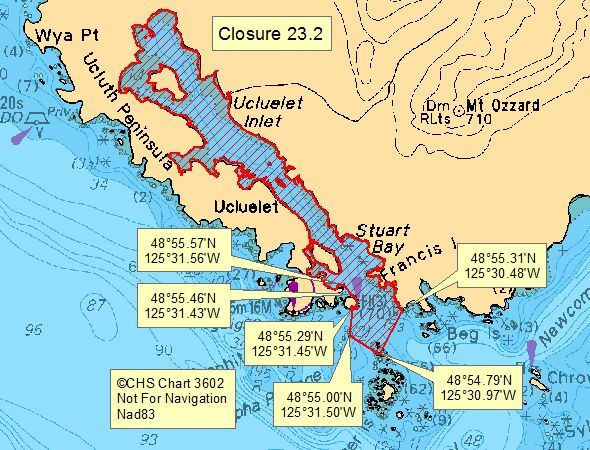 23.10 Julia Passage 23.10.jpeg The waters and intertidal foreshore of Julia Passage, Barkley Sound. 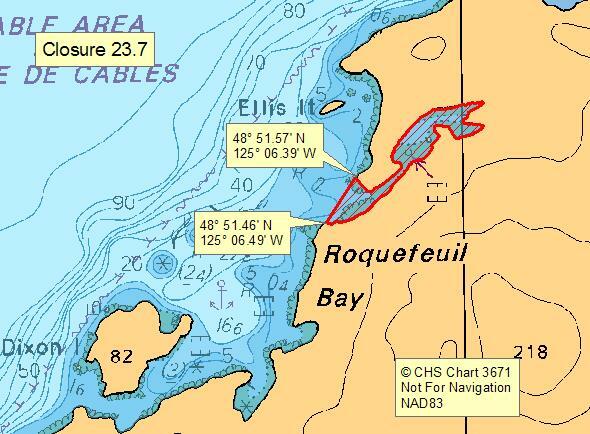 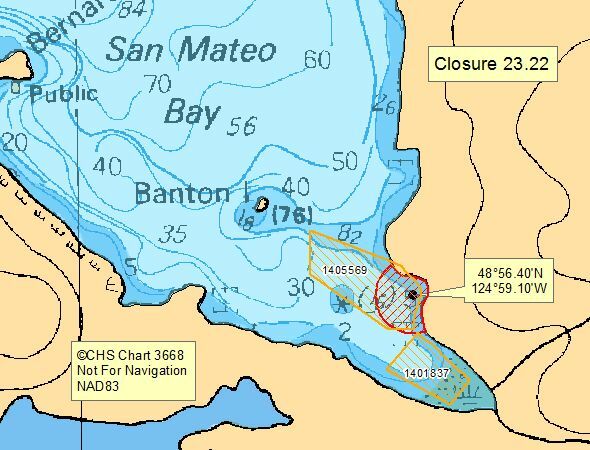 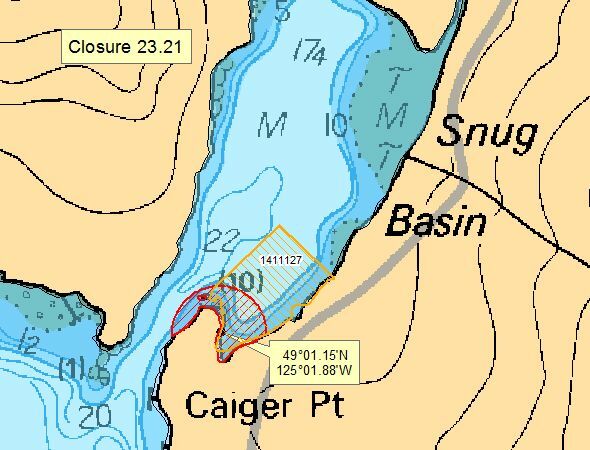 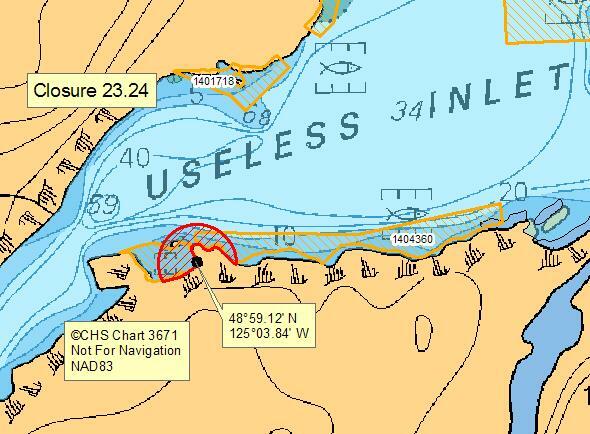 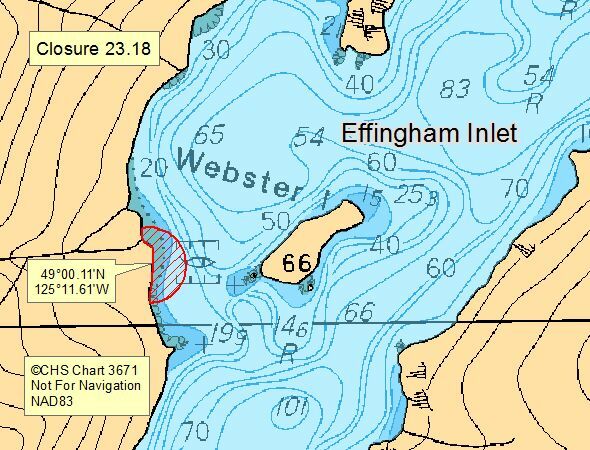 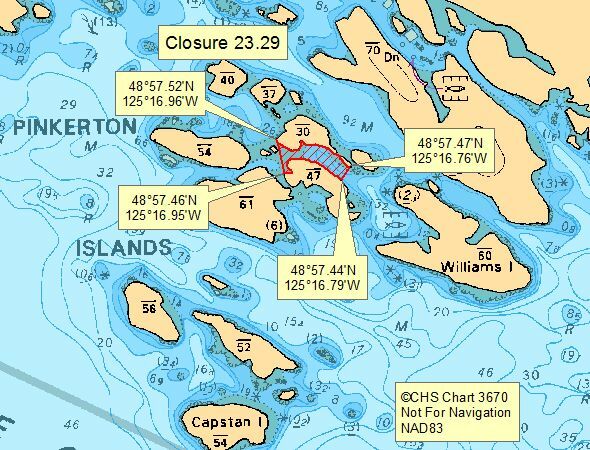 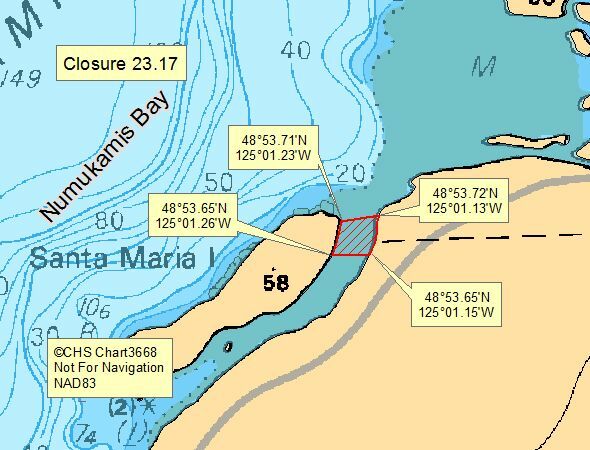 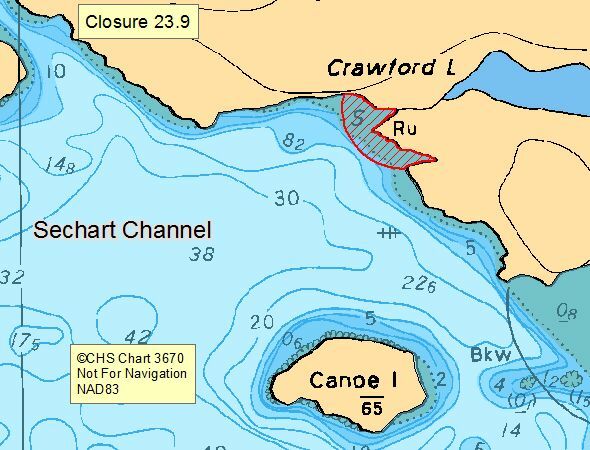 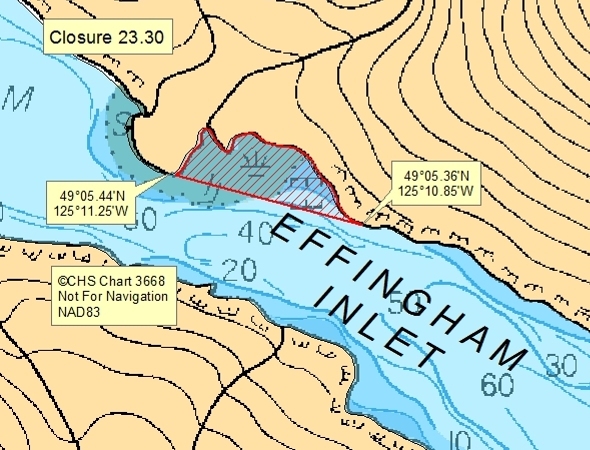 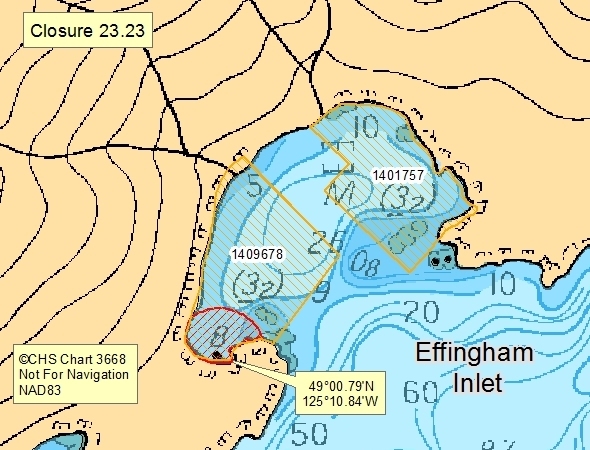 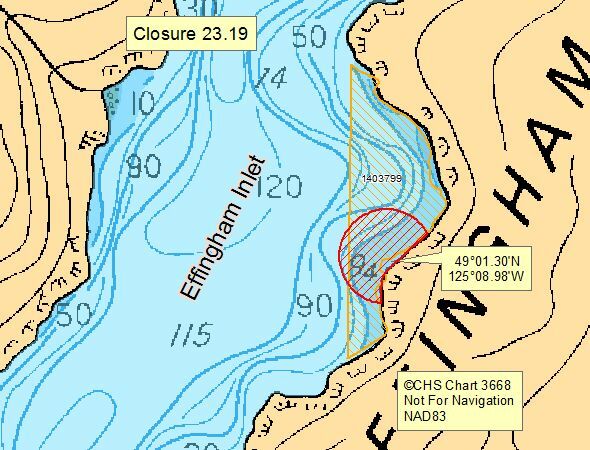 The southern passage entrance closure boundary consists of a line drawn between a point on the Vancouver Island shore located at latitude 48°57.10' north latitude and longitude 125°13.20' west longitude, and the closest headland on the southern island of the Alma Russell Islands. 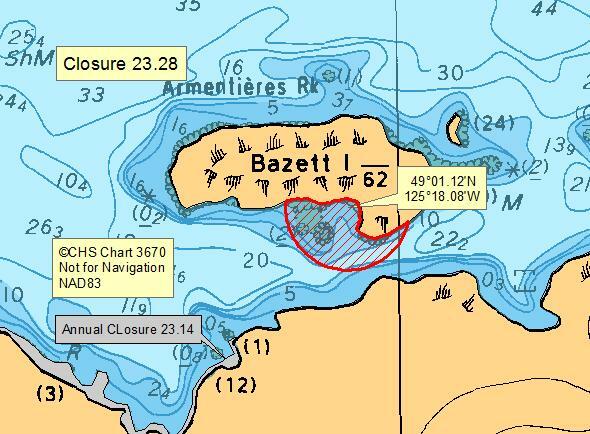 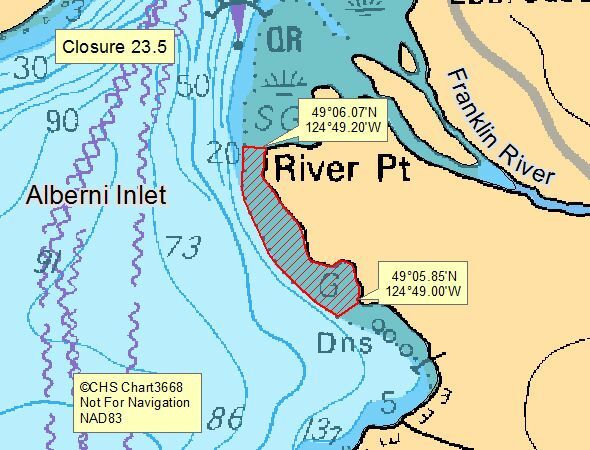 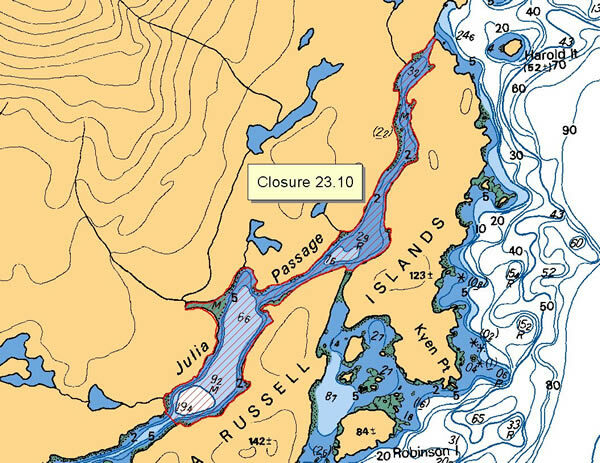 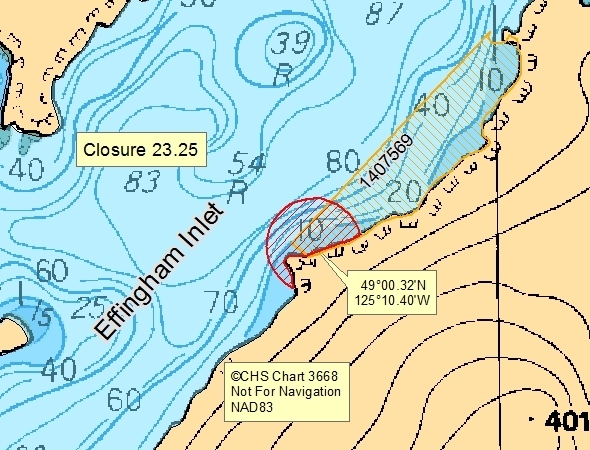 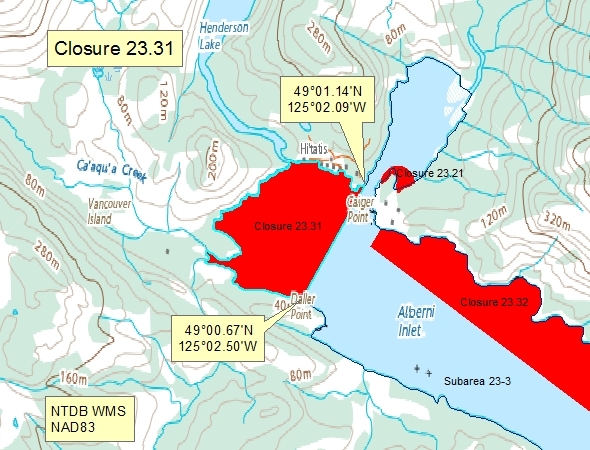 The closure extends north easterly to a line drawn from the north eastern tip of the northern most Alma Russell Island to the Vancouver Island shore [NAD 27]. 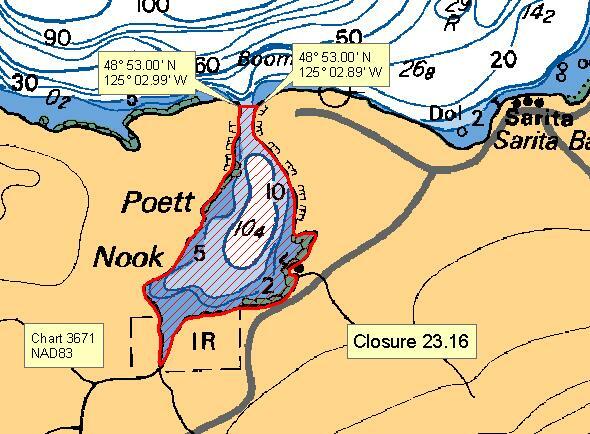 23.2 Ucluelet Inlet 23.2.jpeg The waters and intertidal foreshore of Ucluelet Inlet and a portion of Newcombe Channel, Barkley Sound inside a line drawn from a point of land on the southeast side of the Ucluth Peninsula by Spring Cove at 48°55.57' north latitude and 125°31.56' west longitude thence southeasterly to the northernmost point of Francis Island at 48°55.46' north latitude and 125°31.43' west longitude thence following the shoreline southwesterly to the southernmost point of Francis Island at 48°55.29' north latitude and 125°31.45' west longitude thence southerly to the easternmost point of Jenny Reef at 48°55.00' north latitude and 125°31.50' west longitude thence southeasterly to an islet in the George Fraser Islands at 48°54.79' north latitude and 125°30.97' west longitude thence northeasterly to a point of land at 48°55.31' north latitude and 125°30.48' west longitude thence following the shoreline and returning to the point of commencement. 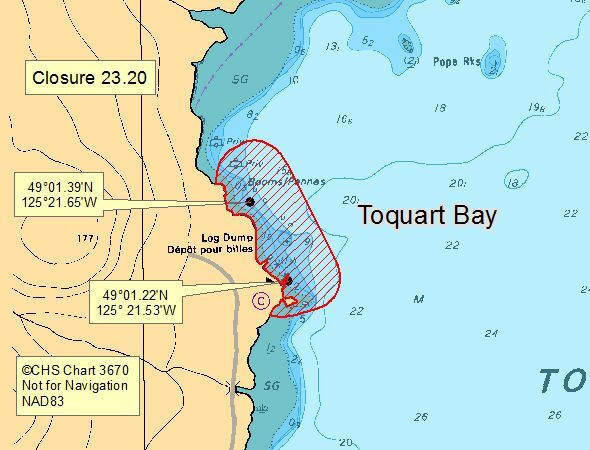 23.20 Toquart Bay - Coulson forest Products Dock and Toquart Bay Campsite Dock 23.20.jpeg The waters and intertidal foreshore at the head of Toquart Bay, in a 125 m radius from any point on the dock fingers of the Coulson Forest Products dock located at 49°01.39' north latitude and 125°21.65' west longitude, and in a 125 m radius from any point on the dock fingers of the Toquart Bay campsite dock at 49°01.22' north latitude and 125°21.53' west longitude. 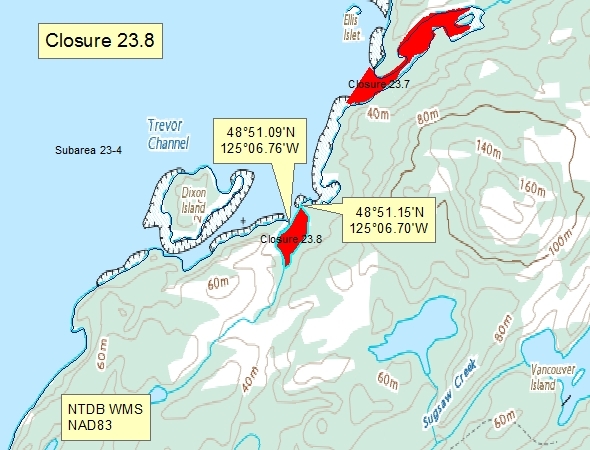 (NAD83). 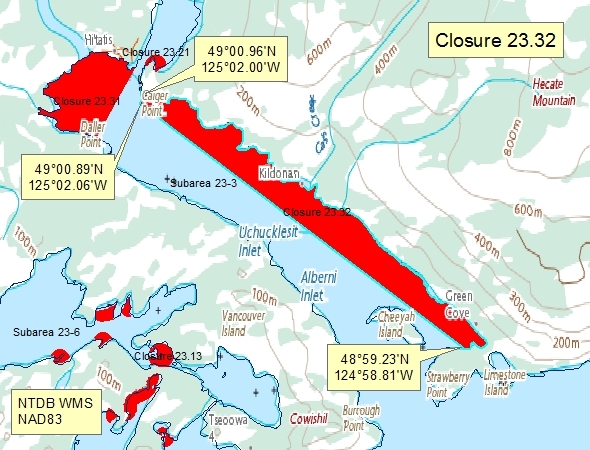 23.28 Southeast side of Bazett Island 23.28.jpeg The waters and intertidal foreshore of the southeast side of Bazett Island, Toquaht Bay (formerly Toquart Bay), within a distance of 125 m from the outer perimeter of the floating living accommodation located at or near 49°01.12' north latitude and 125°18.08' west longitude. 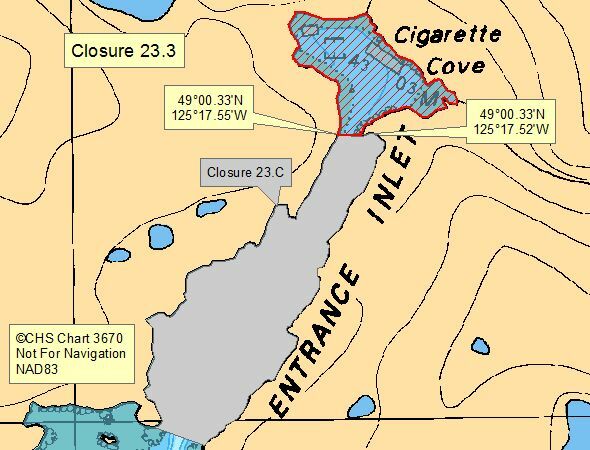 23.3 Cigarette Cove, Entrance Inlet 23.3.jpeg The waters and intertidal foreshore of Cigarette Cove, Entrance Inlet, lying inside of a line drawn across the entrance to the cove at its narrowest point. 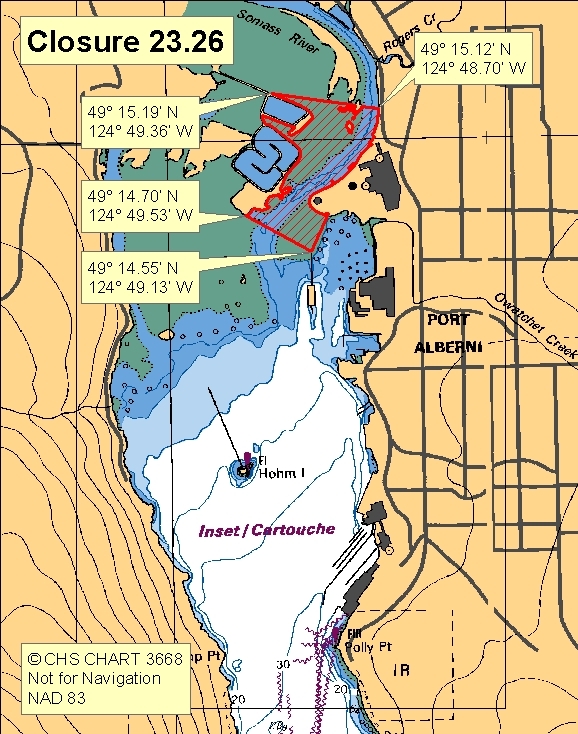 23.5 River Point, Alberni Inlet 23.5.jpeg The intertidal foreshore of Alberni Inlet from River Point to a point 480 m south. 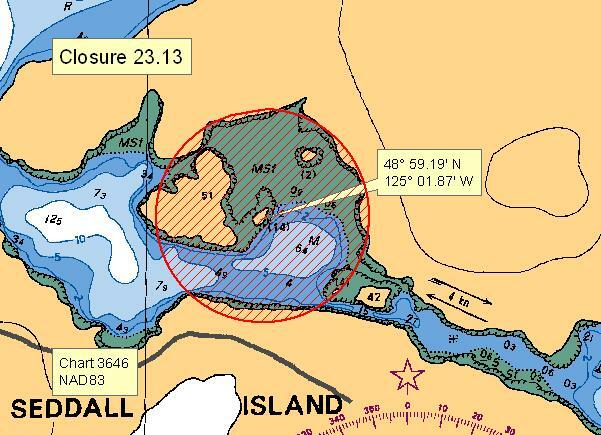 23.9 Crawford Creek, Sechart Channel 23.9.jpeg The waters and intertidal foreshore inside a 125 metre radius of the mouth of the creek draining Crawford Lake into Sechart Channel.